2009 sees the sixtieth anniversary of the Universal Declaration of Human Rights. One of those rights is freedom of speech. This issue of Modern Poetry in Translation celebrates speech that has been freed. Poetry and translation, working together, have often been the means and the best expression of that liberation. 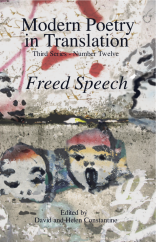 ‘Freed Speech’ features examples from past and present, from all over the world, from all manner of circumstances, of people being enabled to speak and of their voices being heard. It also explores the repression and harming of those voices, but chiefly shows the triumph of the will to speak, the freeing, the recovery and the enjoyment of tongues.